BioBag Small Food Waste Bags are compostable, sustainable, innovative and earth friendly. Designed for your municipal compost program, these bags are highly breathable so the waste dries out. This means that the waste does not rot, and unpleasant smells are reduced. BioBags also have a very high penetration barrier against bacteria, viruses, spores and mould. 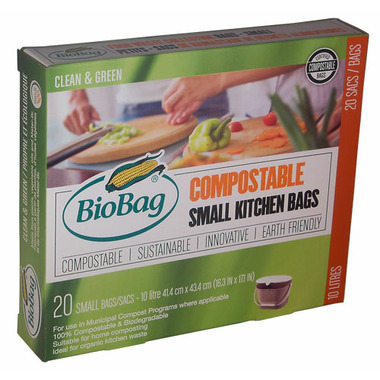 BioBags will compost within 10 to 45 days, depending on the compost methods used. All BioBags and Films are 100% certified Compostable and Biodegradable according to the standards of compostable plastics ASTM D 6400 (North America) and EN 13432(European). I really like that these bags are unscented! I hate the horrible artificial scents most waste bags have, which is why I have been buying these bags for years now. There are my favourite compost bags for the kitchen. Works well for our municipal compost pickup. I keep a bag in the freezer and add to it all week. They are stronger than I had expected and remain soft and pliable when frozen. Will be ordering the pet waste version too. These are great little bags to have on hand. We've started using them for our garbage can instead of the grocery store bags. This product is so far the best type of compost bag I've tried. The bags are a decent size, durable and able to hold a lot of food scraps without breaking. They are also scent-free which is a plus! I love these bags, they hold the compost well, reduce the smells and don't leak. This is the second type of food waste bags that I have bought from Well.ca. I prefer this type and have already reordered more.